This study aims to develop scientific treasures on the focus of educational political studies that are not yet familiar in Indonesia, especially regarding the politics of strengthening Islamic education institutions Era of the Minister of Religion K.H.A. Wahid Hasyim Indonesia that has never been studied by anyone, so this study becomes important to study. This study uses "Interest Groups Theory" which has been incorporated in The Politics of Education Association (PEA) as an analysis knife so that it is relevant to the context of the discussion. The method in this study uses the qualitative method "Library Research" with an educational political approach with historical style. Whereas in collecting data obtained do documentation study and interview, and data analysis technique used by qualitative circular analysis technique by describing, classifying and combining. In this study there were two important findings. 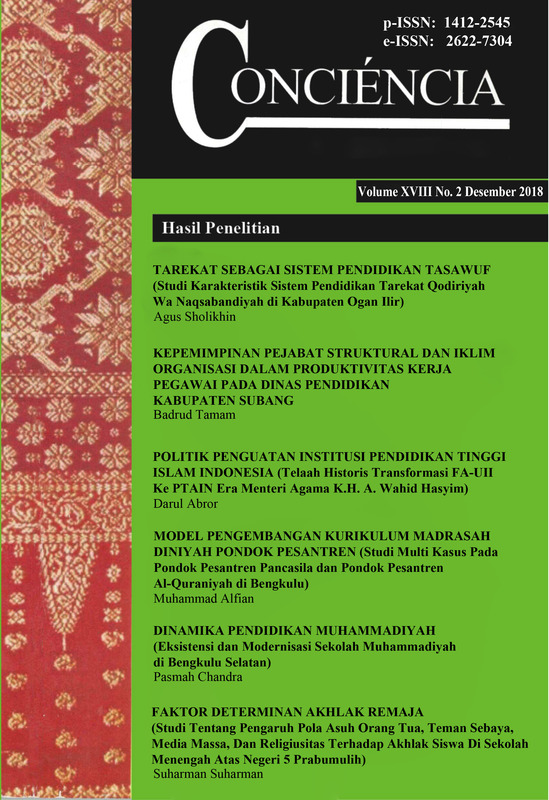 First, the emergence of a program of strengthening Islamic higher education institutions in Indonesia on the basis of the construction of internal and external factors was the existence of the "Balance Motive" praxis by using a rational and spiritual approach which was emphasized in the concept and practice, namely the balance between science and piety, between logic and morality, between religious and public education, both must complement each other which is confirmed through the political program of his institutional notion which is establish a "complete Islamic University and makes PTAIN a modern embryo of civilization under the control of the Ministry Religion. The second finding, in practice, is the interaction pattern used by the era of the Minister of Religion of K.H. A. Wahid Hasyim in the process of strengthening Islamic higher education institutions in Indonesiaisan interaction pattern of "Accommodative Compromistic Associative", namely the pattern of interaction that has an indication of "balanced" synthesis with secular groups, even training with the regime, in ways that are more adaptive and prioritize stability and interests all groups by reflecting competitive, compromise, cooperative and tassammuh and tawassuth processes to reduce conflict between groups with the aim of obtaining alternative solutions.